More 19th-century literature! I get chatty about Charles Dickens, Fyodor Dostoyevsky, Lewis Carroll, and Jules Verne as we finish off this second shelf. And oh, those wood engravings... <3 Let me know if you've read any of these! How does one become the President of China? If the electoral college seems at times hard to fathom, an election in the Chinese Communist Party (CCP) is even more esoteric. According to Kerry Brown, author of CEO, China and former diplomat, the rise of Xi Jinping to the supreme leadership role in China "belonged more to the realm of magic than political science" (p. 92). The process by which Xi replaced Hu Jintao (2003–2013) was unlike a democratic election, in part because it required a consensus amongst the Party: a one-party state cannot be seen as divided. This image of unity is one which brought Xi to power and which continues to challenge him as he seeks to maintain that power. Today I take a nostalgia trip back to the time I first met Sherlock Holmes. Sir Arthur Conan Doyle's legendary detective has impacted my life in many ways, from violin playing to overcoming social anxiety. I also share my thoughts on a number of adaptations, including the Jeremy Brett TV series and Benedict Cumberbatch's Sherlock. 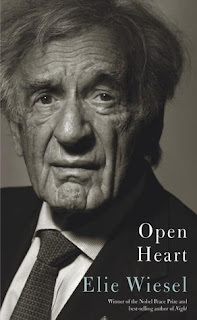 In his memoir Open Heart, Elie Wiesel takes us through his experiences surrounding his 2011 open heart surgery. Wiesel is famous for his Night trilogy, and here some of the same themes come back in short, fleeting chapters - the dark memories of life in Auschwitz and Buchenwald, as well as the perennial question: why does God allow His children to suffer evil? What should a Jewish person's response be in times of persecution or pain? Question marks abound in this short work, underlining the great despair we may sometimes feel when evil touches our lives. Since starting my 9–5 desk job a few years ago, my already poor posture has deteriorated quite a bit, due to hunching in front of two monitors all day. The 8 hours at the desk is not the only problem...when I get home, my first instinct is to switch to my personal laptop (for blogging, etc) or curl up in a chair to read. Neither of these activities helps my posture, of course. I've had this problem for years but only recently became seriously concerned with the longterm effects. While I've tried exercises/stretches in the past, I'm convinced that stretching in itself is not enough. Breaking it down, the first problem, I feel, is simply how to give my back a rest. The last couple of days, I've been experimenting with "constructive rest," part of the Alexander Technique (which I have not done, but probably could benefit from). It's as simple as can be - you just lie down on a flat surface with your knees bent and your head slightly propped up. As president of China, Xi Jinping presides over 18% of the world's population, and he is set to do so for life. How did Xi rise to such prominence, and what can we learn from his life that will help us understand his future? Kerry Brown's book, CEO, China, offers some clues as to the man behind the mystery. "The issue of whether Xi is a 'Maoist' is a live one in China," writes Brown (p. 10). As he goes on to illustrate, Xi's historical and cultural relationship to Mao is not only complicated but personal, with origins that go back to Xi's childhood and his father, Xi Zhongxun. This week I devoted an entire podcast episode to one of my favorite novels, Eugene Onegin. Though I only mentioned it in passing, I also watched Onegin, the 1999 adaptation, after reading the book. Liv Tyler was brilliantly cast as the bookish Tatyana; this was just before she became famous for Arwen in The Lord of the Rings. Ralph Fiennes is a good 10 years older than the title character, but he does a decent job at the Byronic Onegin. Personally, I found the script to be underwhelming and disappointing - too pedestrian (and stylistically British) to really capture the essence of Pushkin's Russia ca. 1830. It's too bad, given the cast. For lovers of Pride and Prejudice and Jane Eyre, Eugene Onegin takes us back to Imperial Russia, where young Tatyana Larina falls for her brooding, Byronic neighbor. More than a romance, Alexander Pushkin's epic poem is a classic of Russian literature and history, as well as a glimpse into the 19th-century dueling culture which proved to be so fatal for him. Russian Ark (2002) - A creative documentary surveying 200 years of Russian culture. I was able to watch this on loan from the library, and while it's a slow film (not gripping), the visuals are interesting. In this second episode, we continue on with more books in my physical bookcase. On this shelf, it's mostly fairy tales and 19th-century literature, from E. T. A. Hoffmann and Mary Shelley, to Nathaniel Hawthorne and the Brontë sisters. Let me know if you've read any of these! Yesterday, I finished reading a selection of letters written by Emily Dickinson (1830–1886). I read some of her best poems in my latest podcast episode, but really, her letters are even more interesting, showing us a glimpse of one woman's life in mid-19th-century America. Here are some of the most memorable quotes from those letters. Being a Young Lady - 1845 How do you enjoy your school this term? Are the teachers as pleasant as our old school-teachers? I expect you have a great many prim, starched up young ladies there, who, I doubt not, are perfect models of propriety and good behavior. If they are, don't let your free spirit be chained by them. Valentines - 1848 Many of the girls have received very beautiful ones; and I have not quite done hoping for one. Surely my friend Thomas has not lost all his former affection for me! I entreat you to tell him I am pining for a valentine. "What do you know about the man who runs China?" the blurb demanded. "Nothing," I blinked. Well, basically nothing. Xi, in fact, may wield more influence than any other secular leader. He functions not only as General Secretary of the Communist Party of China (CPC) but also as their "core leader" - putting him in the same league as Mao. In parallel, he shows the other communist nations (nominally very few) what a strong communist leader looks like. With a GDP on track to overtake the United States' in the next decade, China's version of socialism is not to be ignored, and Xi is well placed to be more than just a figurehead. She left us with over 1,000 poems, full of vibrant imagery and even more mysteries. Join me as I search for the real Emily Dickinson behind the legend, examining her life story and reading such gems as "I died for beauty" and "A bird came down the walk." In The Sea and Poison, we find one Japanese author's perspective on the horrific human experimentation carried out by Unit 731 "doctors" in World War II. A small addendum to my comment in this episode, that there were "no Nuremberg trials, to speak of." The Soviets actually staged their own show trials for some of the Unit 731 personnel. However, sources indicate that the sentences were light and may also have been exchanged for data. To me, this is hardly the equivalent of the Nuremberg trials, where several nations (not only the USSR) took part in the trial and the sentences included 12 executions and seven imprisonments. Jurassic World 2: Dinos and Russians and Clones, Oh My! Yesterday my sister, brother, and I hit the local movie theater for a viewing of Jurassic World: Fallen Kingdom. We're relatively new fans - Jurassic World 1 (2015) was a first for us - but having since enjoyed the rest of the franchise, we were excited for the next installment of prehistoric monsters chasing after the indestructible Chris Pratt. After enduring 20 minutes of inanity - er, previews - we sat up in our seats with zeal, watching a very tiny, obviously illegal submarine descend the watery coast of Isla Nublar. This tremendous opener was, alas, the beginning of a tremendous letdown. Let me break it down into some coherent chunks of thought. Lately, I've been enjoying the music of a little-known band called Tow'rs, whose style comes under the "indie folk" genre. (Indie folk is a wonderful invention of old time instruments - fiddle, banjo, guitar, cello - combined with new lyrics and melodies.) Tow'rs is from Arizona, and their specialty is infusing their songs with thoughtful meaning, while keeping the instrumentation and vocals gentle. They also apply Christian themes to some of their songs, with subtlety which fits the music well. And calls for youAdmittedly, I'm rusty in my Bible memory, but I could not place this phrase - "the hound of Zion." Where did that come from?